If you’re lamenting the fact that Melbourne doesn’t have enough green spaces, well you’re in luck. Not only are we getting six new parks by 2020, an elevated green oasis opened in the city last year and it’s fully accessible to the general public. They’re calling it a “skypark”, which naturally makes it sound a little like Kami’s Lookout from Dragon Ball, but it’s a little more grounded than that. 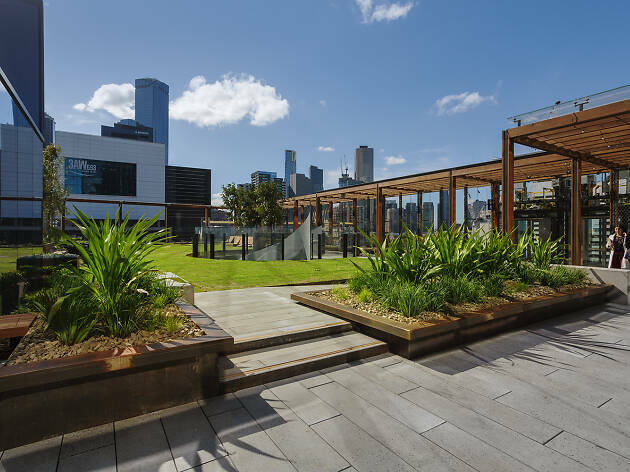 The park is located above Collins Street beside Southern Cross Station and you can reach it by climbing a spiral staircase from the train station level. 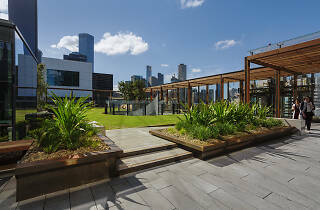 The first stage of the park is now open within the new Melbourne Quarter precinct of Collins Street. The second part of the park will be opened when the precinct’s third commercial building is completed (though no date for this has been set). It’s a Wi-Fi-enabled public park and features plenty of green lawn, built-in outdoor seating, landscaped gardens and a bookable outdoor meeting room for tenants of the local buildings. It’s currently open Monday to Friday, 8am to 6pm, making it a nice respite for local office workers. Check it out for yourself the next time you’re nearby SoCro station. We ranked Melbourne’s best parks – did your favourite make the list? Here’s what happened when we tried forest bathing in Melbourne.